From Australia: by ABC's Stella Young. Stella Young is the editor of ABC's Ramp Up. She tweets @stellajyoung. In March this year swimming enthusiasts sat glued to their televisions, waiting with baited breath to see the likes of James Magnussen, Libby Tricket and Ian Thorpe take to the pool and secure their place in the team for London 2012. The trials were organised by Swimming Australia which is, according to its website, "the national sporting organisation which is responsible for the promotion and development of swimming in Australia at all levels." The organisation draws government funding and other significant sponsorship to represent swimmers both with and without disabilities. Yet you could be forgiven for thinking that the televised trials back in March were purely for non-disabled athletes seeking to make the Olympic team. This was not the case. 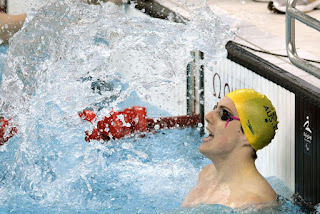 Swimmers such as Matthew Cowdrey (pictured), Rick Pendleton, Katrina Porter and Matthew Levy, all of whom have won Paralympic medals in Athens, Beijing or both, were also in the pool during the course of the trials, but you wouldn't have seen them swim. You see, they were asked to swim during the ad breaks. This didn't go unnoticed by all. Many supporters emailed the organisation, claiming that they were discriminating against athletes with disabilities by failing to promote and support them as prominently as the non-disabled swimmers. A group made up of athletes' family and friends of called Parents, Pals and Partners Of Our Swimmers (POOS, for short) made their dissatisfaction known. They were met with a letter from Swimming Australia's lawyers, threatening legal action and refusing to discuss the matter in the lead up to the games. While I'd have loved them to come up with a slightly less ludicrous name, the POOS view that Swimming Australia is disregarding disabled swimmers certainly has weight. Disability Discrimination Commissioner Graeme Innes agrees. "I think it is pretty disappointing that Swimming Australia would view the efforts of swimmers with disability as so much less important than athletes without disability. I bet our paralympians will bring back more gold." David Gandolpho, speaking as a representative of POOS on 7.30 this week, said of Swimming Australia: "They are the administration of swimming. That's all swimming, that's the able-bodied swimming, the disabled swimming. There shouldn't be any distinction between who they're looking after or whose interests they're taking care of or promoting." Who should they have been promoting? Well, Matt Cowdrey for one. Despite the fact that most Australian's have never heard of Cowdrey, he's one of our greatest athletes in the pool. To compare him to the likes of James "The Missile" Magnussen would be unfair. After all, Magnessen's accomplishments, while of course significant and admirable, pale in comparison to those of Cowdrey. With just three years on his Swimming Australia colleague, Cowdrey is about to compete in his third Paralympic Games. Having broken his first world record at 13, Cowdrey is well on the way to becoming Australia's most successful Paralympian. In fact, if he can eclipse Tim Sullivan's 10 gold medals in London, he will. He already has eight under his belt, along with four silver and two bronze. Why then is Swimming Australia not giving him every bit as much support as the Magnussen's of the sport? Probably for the same reasons they asked him to swim during the ads; because they assume we just aren't that interested. Squeezing in the disabled athletes as though they're little more than half-time entertainment is telling, not just of the way the organisation views a proportion of those it represents, but how we have traditionally valued disability sport. The Paralympics have for too long been considered the poor cousin of the Olympics. It's always run after the main games, and rarely gets anything like the media coverage. The London 2012 Paralympic Games is, in fact, the first to not give away the majority of event tickets. The majority of tickets bought for the Beijing Paralympics were purchased by the government and given away to community organisations. Of the 2.2 million tickets sold, 1.82 million were government purchases given away for free. London Organising Committee of the Olympic and Paralympic Games has made a deliberate decision to take a different path, a move welcomed by many Paralympians who believe the giving away of tickets devalues disability sport. With three weeks to go until the Paralympics opens, 1.4 million tickets have been snapped up, proving that sports-fans are not as discriminating as some might think, and that LOCOG's move not to give them away for free was the right one. People will not only watch disability sport on television, they'll pay for it. Swimming Australia needs to get with the times.